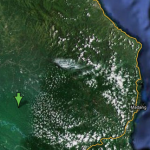 New Guinea Binatang Research Center helps with the conservation and biological research of our forests. John Swire & Sons and Steamships Trading Company Ltd. funds our community projects and also provided funding for the Swire Research Station. Darwin Initiative for the Survival of Species supports conservation-linked research and economic activities by the community, including ecotourism. Seacology awarded our community leader Filip Damen a conservation prize and is now contributing funds towards our elementary school. Christensen Fund supports efforts to connect traditional biological and cultural knowledge with modern science. UNDP Equator Prize awarded to the Wanang Conservation Area for “innovative conservation”. Waterloo Foundation supports business activities in the Wanang community providing support to conservation. Our forests are studied by biologists from the University of Minnesota, Smithsonian Institution, Czech Academy of Sciences, Sussex University, Center for Tropical Forest Science, University of South Bohemia, PNG Forest Research Institute, Oxford University, Brown University, and the Charles University. Our forests are studied by PNG postgraduate students from the University of PNG, PNG University of Technology and Goroka University.